Beautiful Hedy Lamarr was known mostly for being an elegant actress, being one of the MGM stars during the “Golden Age” and a well-known face during those years. Apart from being a crowd darling, she helped invent spread-spectrum communication techniques using frequency hopping. This technology is still used today, and it was the Austrian actress and inventor who contributed to its pilot development. Hedy Lamarr was the stage by which she was known. 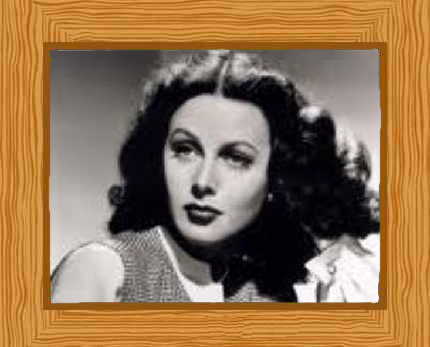 Hedy was born on the 9th of November in 1914 to parents Emil Kiesler and Gertrud or “Trude” Kiesler in Vienna, Austria-Hungary. Her birth name was Hedwig Eva Maria Kiesler. She was of Jewish descent, her mother being a Budapest native who originally came from the “Jewish haute bourgeoisie.” Her father, who was born in Lemberg, was a secular Jew. She was 17 when Lamarr first appeared in a film, called “Geld Auf Der Strase” (Money On The Road). Her career in entertainment made a strong presence in the Czechoslovakian and German productions of that time. The German film “Extase” in 1932 brought Hedy to the attention of Hollywood producers. A few years later, she became an MGM contract star. When Lamarr entered Hollywood, she adopted her stage name and her first Hollywood film, “Algiers” was released in 1938. Lamarr had a successful career in entertainment and was known as “the most beautiful woman in films”. She wrote an autobiography called “Ecstasy and Me” which detailed her private life. She married her first husband, Friedrich Mandl, a wealthy Austrian in 1933. Lamarr’s autobiography described her husband as an extremely controlling man who prevented her growing her acting career. She stated that she felt imprisoned in their castle-like home where parties were held and where notable people like Hitler and Mussolini attended. Also in her autobiography, she stated that she devised a plan to escape her controlling marriage by disguising herself as her maid and then leaving for Paris, where she subsequently blossomed as an actress. They were divorced in 1937. George Anthiel, an avant-garde composer happened to be Lamarr’s neighbor when she lived in California. The son of German immigrants, he had been experimenting with the automated controls of musical instruments, especially for the music he composed for the Ballet “Mecanique”. During the Second World War, Lamarr and Antheil discussed how radio-controlled torpedoes that were being used by the navy could be disrupted by broadcasting a particular interference at the signal’s frequency control, which would ultimately lead the torpedo off target. Together with Anthiel, Lamarr developed the “Secret Communications System”, a patented device which manipulated the radio frequencies at irregular intervals during reception or transmission. Their invention formed a kind of unbreakable code which prevented classified information and message transmissions from being intercepted by the enemy. Lamarr obtained her knowledge about torpedoes from her first husband, Mandl, and she used her knowledge to help develop this invention. With Anthiel who incorporated the use of a piano roll, they were successfully able to devise frequency hopping. They used the 88 piano keys to randomly change the signals within the range of 88 frequencies. In 1942 the patent for their invention was granted. However, the early version of the frequency hopping technique was met with disapproval by the United States navy and therefore was not adopted. Their idea was not used by the navy until 1962 when the military used it for a Cuban blockade; the patent had by then already expired. In 1997, the invention was honored by the Electronic Frontier Foundation which gave Lamarr credit, although belatedly, for her contribution to this technology. Today, the work done by Lamarr and Anthiel is the basis for the modern spread-spectrum communication technology. It is the idea behind Bluetooth, Wi-Fi connections, and GPS. Lamarr wanted to join the National Inventors Council (NIC). However, it was said by the NIC member Charles Kettering that she could help with the war efforts better if she would use her celebrity status for selling war bonds. In April of 1953 Lamarr became a naturalized American citizen at the age of 38. Her “Ecstasy in Me” autobiography was published in 1956, although she later stated that much of it was fiction. Even in the 1970s, she was offered scripts, commercials for television, and stage projects. None of these offers, however, appealed to her and these years became her years of seclusion. In 1981, with her failing eyesight, she chose to retreat to Miami Beach in Florida. During her life, Lamarr was married and divorced six times and she had three children. On 19 January 2000, aged 86 Lamarr died in Florida due heart problems, namely arteriosclerotic heart disease, chronic valvular heart disease, and heart failure. Because of her contributions especially to the world of entertainment, she was given a star on the Hollywood Walk of Fame.